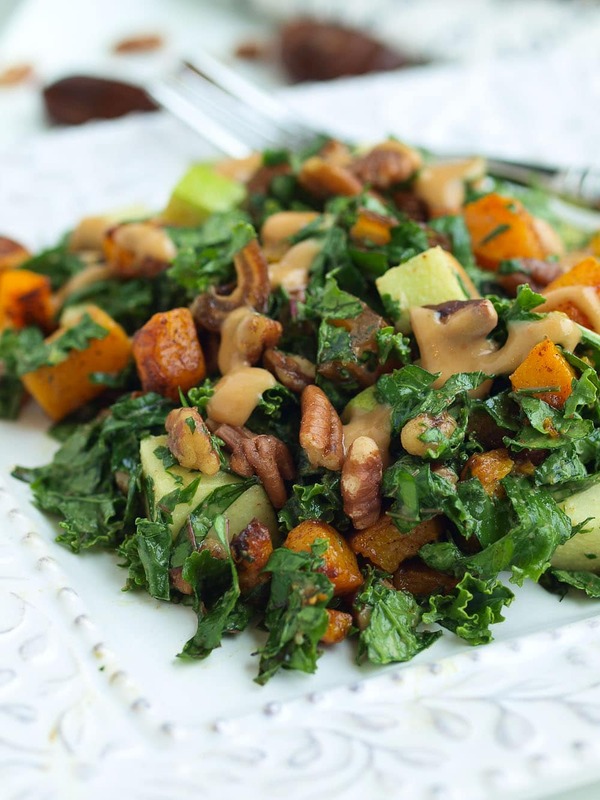 This Autumn Kale Salad with an oil-free dressing will transform the way you think about kale salad! I have a confession. This might be hard for you to believe since I run a whole blog based on healthy eating. Okay, here it goes: I don’t really love kale. Wait…whaaaat? Did you just hear me correctly? Let’s be honest. If you take a big bowl of plain, raw kale, it just doesn’t taste good. Nobody was more shocked than me when it became the foodie world’s darling. Who’s with me here? Do you think kale is a hard-to-swallow green? What I do love about kale is its nutritional stats. Did you know kale has over 45 different flavonoids, the nutrient group known for its antioxidant and anti-inflammatory benefits? Want to read more? Check out these 26 Science-Backed Health Benefits of Kale!! I could go on and on, but just know that kale is one of the best foods on the planet, nutritionally speaking. It’s pretty amazing that such a nutritional rockstar has become so trendy. We can fix that. If you aren’t into kale, I can show you how to make it a new favorite. While plain kale and I will never be BFFs, I have learned over the years how to make it taste as great as its nutritional stats. Even raw kale, in a salad, can be fantastic. First, we have to take care of the texture issue. Kale is a tough green. Big pieces of raw kale are not easy to chew. So chop it finely. Really, really, finely. Now let’s give kale a little help in the taste department. Toppings are key. A little sweetness helps counter kale’s natural bitterness. Here we have chopped dates for the sweetness, tart, crisp apple for more contrast in both flavor and texture, and some crunchy toasted pecans for additional balance. Some cinnamon-spiked butternut squash gets added at the end. This is an autumn salad, after all. Every salad is made (or ruined) by its dressing, and a kale salad is especially reliant upon an outstanding dressing. Here we have an oil-free dressing that you will want to eat by the spoonful. It’s that good. As pretty as it looks, you can’t just drizzle it on top and call it a day. You have to toss that salad to coat the kale leaves. You can put a little of the dressing aside so you have extra to drizzle on top at the end, if you prefer. But make sure you coat each kale leaf in the dressing. Now you’ve got yourself a company-worthy kale salad that will help everyone, even the kale-haters, to understand why kale has been become a vegetable celebrity. 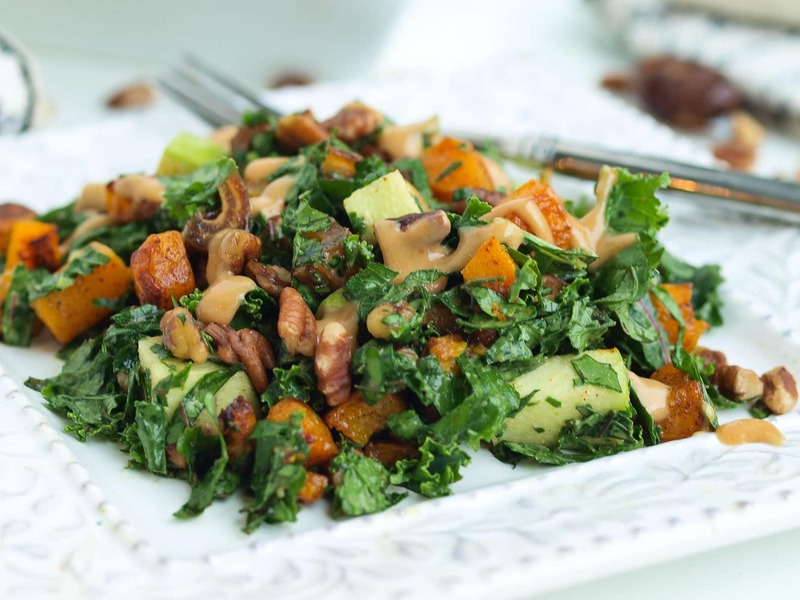 This Autumn Kale Salad is bursting with sweet roasted vegetables and an incredible dressing that will have you wanting to make it over and over. Preheat the oven to 425 degrees. Place the diced butternut squash on a rimmed baking sheet. Drizzle with the oil, cinnamon, and salt and use your hands to evenly coat the squash pieces. Roast in the preheated oven until the squash is tender, about 20-25 minutes. While the squash is cooking prepare your toppings and dressing. To toast the pecans, place them in a small skillet over medium heat for 3-4 minutes, until they are lightly browned and fragrant. 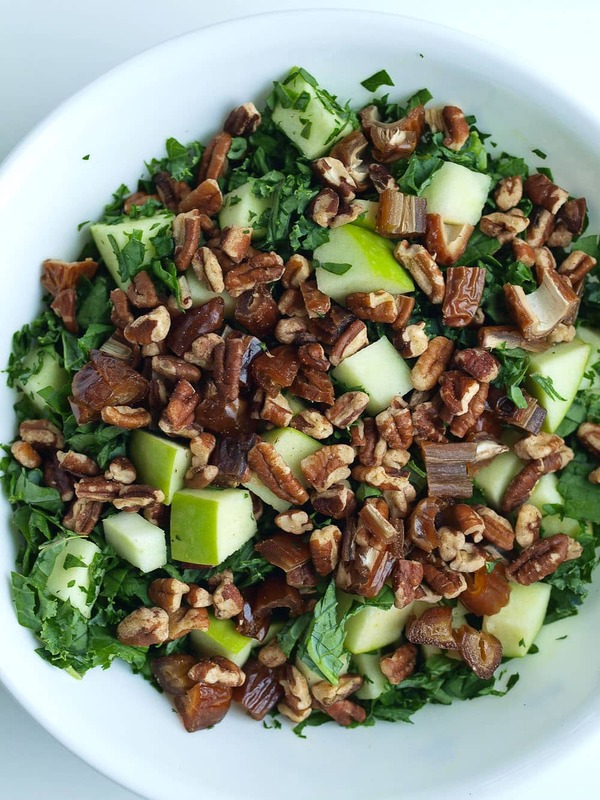 To make the salad, first combine the kale, apple, pecans, and dates. Top with the dressing and toss to coat well. If desired, reserve a small amount of the dressing to drizzle on top of individual salads for aesthetic purposes. Now gently add the cooked butternut squash and lightly toss. Enjoy! I hope that I’ve convinced you that kale can be transformed into something wonderful. It’s taken some time, but I am a believer! 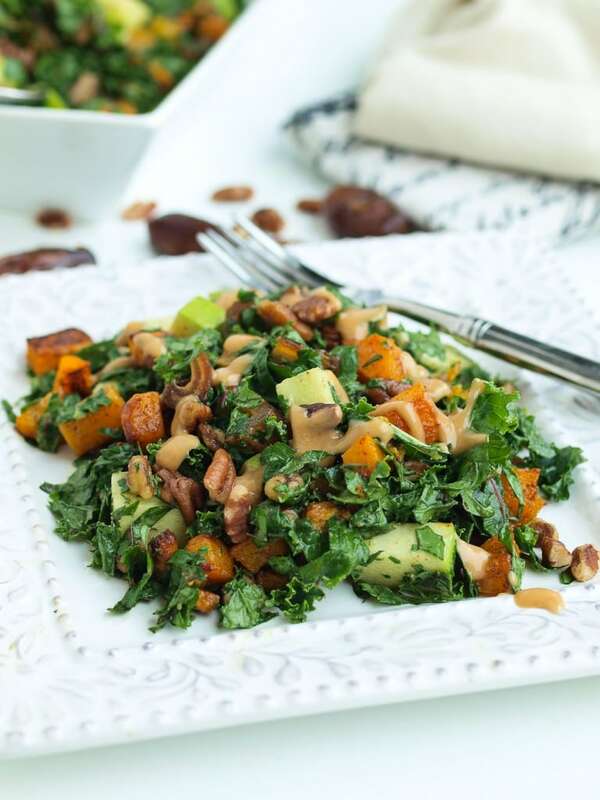 If you make this Autumn Kale Salad recipe, or any Happy Healthy Mama recipe, I would LOVE to see it! Please take a pic and share it on Instagram or the Happy Healthy Mama Facebook page and tag me @happyhealthymama ? I don’t like kale on its own either. It has a strong taste. I usually de-vein it and mix it in salads, smoothies, stews, and casseroles. When I want my kids to eat something that I know they would refuse (such as kale or mushrooms), I cut the food in small pieces. I think this salad would go really well with my kids. I might replace the dates with raisins or cranberries as neither of my kids are fan of dates (yet :)!). Please let me know if your kids like it! I HATE raw kale too but your suggestions are all on point to make it delish! It sounds weird but massaging the kale (with olive oil/lemon juice) for a few minutes, until the leaves turn darker help to cut the bitterness and make it much more edible as well! I like massaging with avocado sometimes, too! 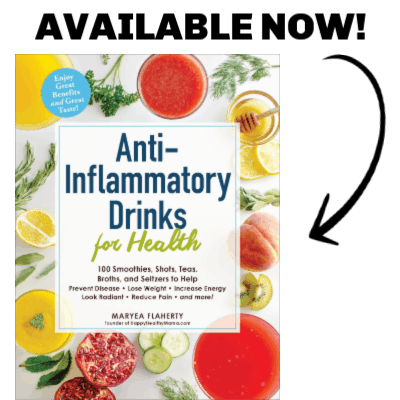 like some of your other readers, I just put kale in my smoothies to get the rock star veggie in my system. 🙂 I too have tried to eat it in salads and it is a tough one. This looks so delicious so I am going to have to try it. 🙂 Stepping outside my box with the squash–but I can do it. 🙂 Do you think almond butter will work ok in the dressing vs. the cashew butter? Maryea this looks so good. Love love seasonal recipes. This salad – girl you have all my favorite ingredients in one place – who would have thought to add dates!! I’m so in love – anyway I can eat more dates 🙂 I could eat this everyday and be a happy girl! I LOVE nut butter-based dressings, and they are my preferred condiment to top raw kale salads with. 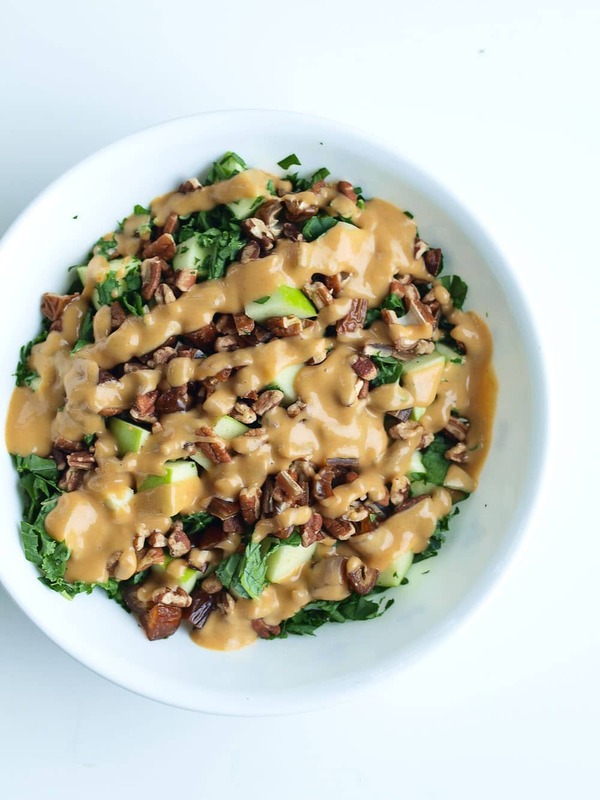 Whole Foods has a recipe for a Waldorf-style kale salad on their site using a walnut butter and apple based dressing that was AMAZING! 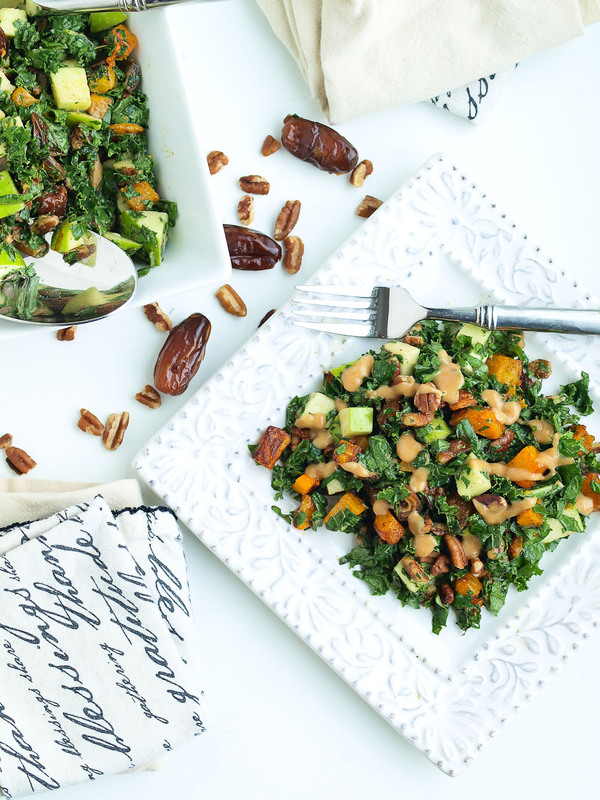 I’m a HUGE fan of sweet and savory combos and using apples and/or raisins (or dates) in my kale salads. I made this for lunch today and wow!,it was great! Thank you! We only get black kale at the stores where I live and nut butter is very very expensive here, as it is imported, so I made my own by blending half a cup of mixed nuts, half a cup of sunflower seeds, 2.5 tbsp of coconut oil, 2 tbsp of honey, half tsp salt and enough milk to emulsify. I used all the nut butter in this recipe and didn’t have pecans so used sunflower seeds instead. I found that the other ingredients and dressing were still not enough to mask the texture and flavour of the black kale so I threw it all in a big pot and added a chopped onion fried in 6 tbsp of olive oil, 2 cups of roasted cauliflower, 2 garlic cloves and 6 cups of vegetable stock. Brought the mixture to boil then simmered on medium-low heat for 25 minutes then blended it. The soup came out really delicious! So for anyone reading this recipe and still can’t stomach the kale, turn it into a soup! This salad is fantastic! It is a new favorite. Thanks, Yvonne! So glad to hear that!